Many a faculty teaching at AIIMS have written a letter to the Prime Minister asking him to look into the process of faculty recruitment being done at AIIMS. They have alleged a violation of reservation policy in the institute during the recruitment process. 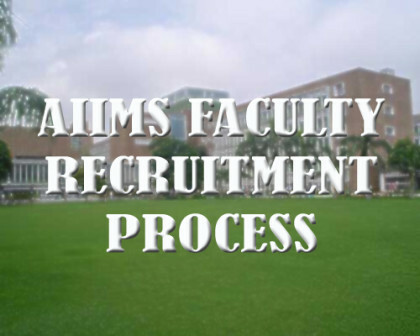 As per sources at AIIMS, the recently held faculty selection, majority of reserved posts were left vacant on the ground that no suitable candidate was found. Alleging reservation violation, the doctors are demanding constitution of a parliamentary and judicial committee to look into the issue. “In the recently held faculty selection, out of total advertised 96 posts, only 76 candidates were selected. Majority of the reserved posts were left vacant on the ground that no suitable candidate was found,” the members of Forum for Rights and Equalities, who have demanded the PM to faciltate a special recruitment drive to fill all the vacant posts for SC, ST/OBC categories at all levels, including the faculty. They claimed a petition signed by more than 60 faculty members from All India Institute Of Medical Science was submitted to the president of the premier medical institute on May 29, requesting review of the faculty selection process. This grave matter of violation of reservation policy of government of India in AIIMS, New Delhi was also discussed in the floor of the Parliament and assurance was given by the Union Health Minister that the on going process of selection of faculty will be reviewed and ‘zero tolerance’ to violation of reservation policy will be ensured. “Despite these assurances, the AIIMS administration in blatant disregard for the Parliament and Government of India, went ahead and declared the results of faculty selection for year 2015 with gross violation of reservation policy on numerous counts,” they said in the letter. Besides review of the selection process, the group demanded a mechanism for optimal implementation of reservation policy at AIIMS and the appointment of a ‘parliamentary reservation implementation committee’ to monitor implementation of reservation policy in all medical institutions of the country.